I have been doing this professional for over 35 years and one of the things that I have learned aside from the fact that weather forecasting can be a truly humbling experience both in the short and long term forecasts. There have been so many recent stories about El Nino 1997-98 and that the result for the upcoming winter will be a stormy and wet one in the west and a wet and mild winter in the east…just like 1997-1998. In that particular winter the only snow of consequence in New York City came in the spring! Well with this on the table as the most obvious outcome let Joestradamus point out the the trash can is filled with forecasts based on the obvious that turned out to be not so obvious when it all played out. Firstly let us deal with the comparison of the 2 el nino events. For those who don’t know El Nino is a warm of equatorial Pacific Ocean water temperatures to an above normal state. Simplified this amplifies the subtropical jet stream across the US bringing weather systems into California and pushing warm air into the east. This displaces the normal rain to snow line further north resulting in below normal snowfall for the Mid Atlantic and Northeast. This is the simplified explanation. This also assumes btw that there are no other factors that impact winter weather in the east. 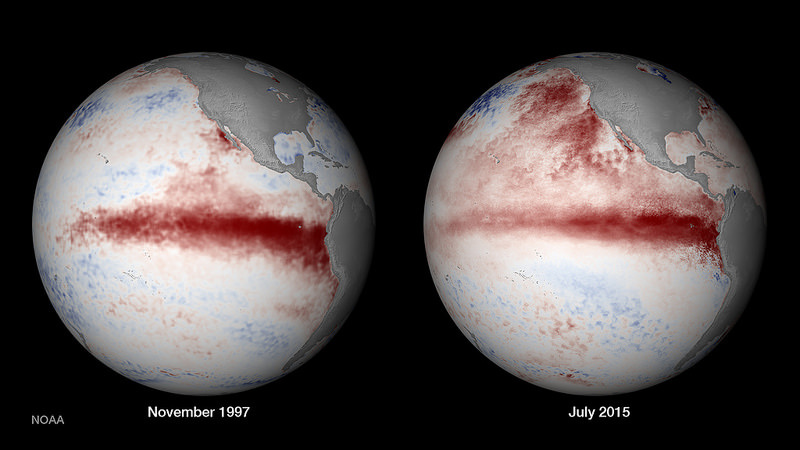 Firstly let us look at the el nino from 1997 as compared with the el nino right now. Notice that the area of above normal water temps in the Pacific matches up to some degree with 2 notable differences that are very important. The first is that the magnitude of this el nino is a little less than the one in 1997-98. The second is the warm water that off the Pacific Northwest and the Gulf of Alaska. This pool of warm water was the same pool that was around all last winter and was one of the primary drivers of our pattern in the northeast.This difference is a very important player if those waters in the Pacific NW to the Gulf of Alaska remain that way going into the winter. This could make the outcome different this time around. I emphasize could because we just don’t know what the combination of the 2 will mean. Second important difference could be the North Atlantic and the potential blocking pattern that shows up from time to time in Greenland or the Greenland Block. The block displaces cold air southward into the northeast. It has been for the most part absent for the last 3 winters with only occasional appearances. Last winter models kept trying to make one and it never happened as the Pacific dominance was just way too overwhelming. Dave Tolleris of WxRISK who I have a lot of respect for posted this yesterday and this is another interesting consideration. We have been in a strong blocking phase this month. 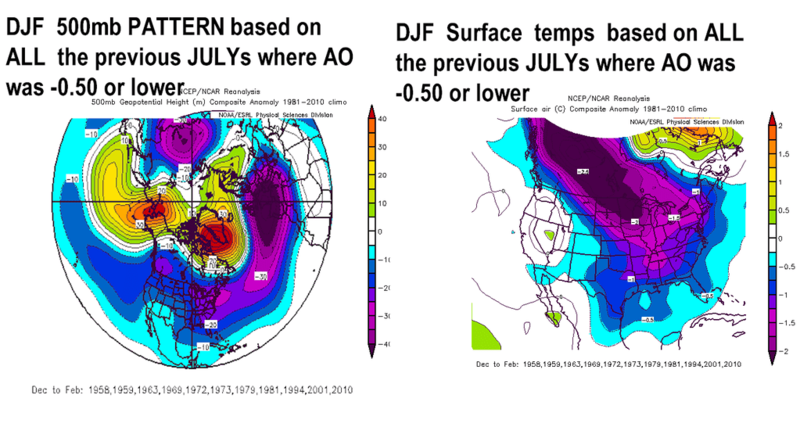 In that blocking phase it has turned out that in the 11 Julys shown where this has been the case, the upper air pattern in the subsequent winter has been dynamic in the east. Not all of these winters produced big snows but a number of them did. Noteably in this stretch is 1993-94 and 2009-2010 among others. Also there are winters in there where the snows were quite variable. For example 72-73 is on the list where NYC experienced its lowest seasonal snowfall on record but the mean rain snow line set up just to the north of the coastal plain. Three of those winters are shown on this chart below. 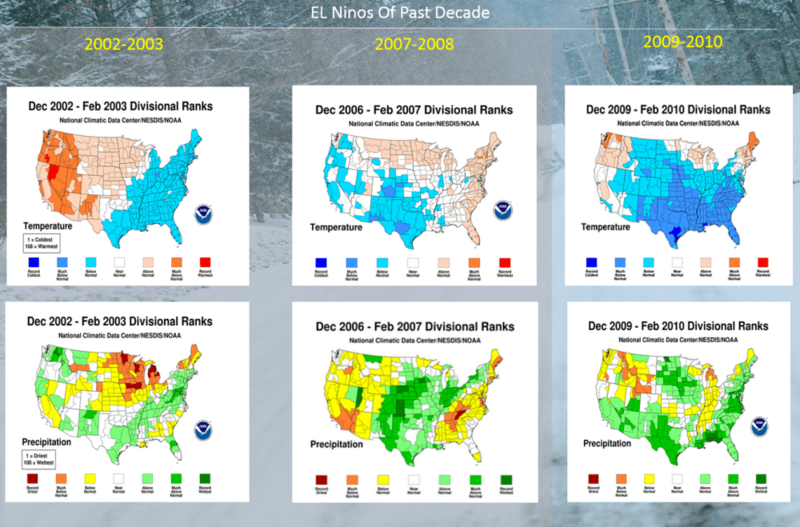 2009-2010 comes up here which was a year with a strong el nino but also very strong blocking and in that winter the blocking won out most of the time. So what does Joestradamus conclude from this? Well frankly at this point nothing. One of the problems with forecasting as that we know now whats going on now and we can predict what it might look like down the road, but it never comes out exactly the same. Will strong blocking overwhelm a very powerful el nino? Frankly I have no idea. No one does on August 5th. We are gathering clues of course along the way. In October everyone will be salivating over the Siberian snowcover indicator which last year turned out right for the northeast but for the wrong reason. And it wasnt right for other areas. Then of course by the late fall the El Nino could be peaking according to forecasts. What does that mean and what of its impact. And what about the North Atlantic blocking? It is present now and 11 times out of 11 when it has been this strong it has appeared in the winter time. That is a formidable stat but what if that doesn’t happen for some reason? We have been in an above normal snow cycle here in the northeast for the last 14 winters. Does that continue? Could this be a break year for the NYC area and nearby where some places have seen 6 of the last 7 winters with above normal snowfall and mostly below normal temperatures? My point here is that the to ask about the outlook for the upcoming winter at this point is really a futile exercise. It is way too early to come to any conclusion that is nothing but a lucky guess at this point. And what if you did know. Granted if you were a futures trader or someone in an energy related business you could plan ahead but for everyone else, are you going to sell your house and move? At this stage there are probably another few weeks of summer weather to enjoy. Do that and worry about the winter in November.